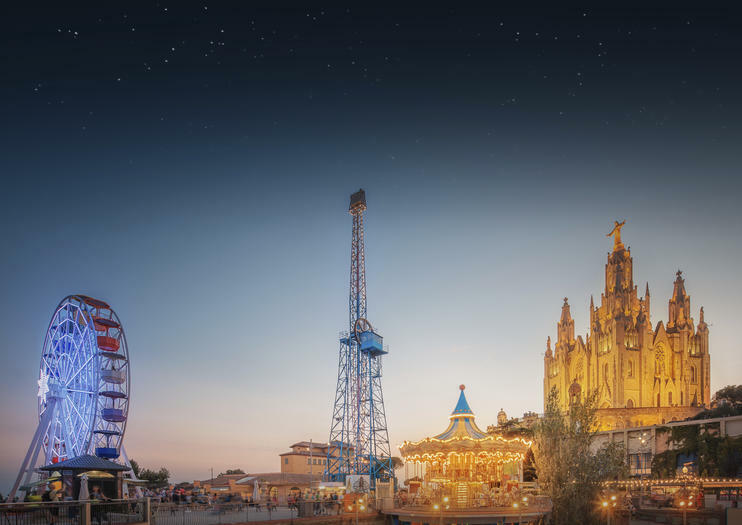 The amusement park concept is taken to a new level, very literally, at Tibidabo Amusement Park. That’s because it is situated at Barcelona’s highest point, on Mt. Tibidabo. From there, you can ogle nearly 360-degree views as you soak up the charm and adventure that the vintage amusement park has to offer. Vintage, indeed, as the mountaintop destination was opened back in 1889, and to this day still features some of its older, classic rides alongside more modern, adrenalin-driving attractions. Meanwhile, part of the thrill of this whole experience is that of getting there, which includes the Tramvia Blau, a old-fashioned tram that opened in 1901. While up top, also take the chance to visit the Temple de Sagrat Cor, a Neo-Gothic church located at the summit. The Tramvia Blau can be reached by the L7 train from Plaça de Catalunya (stop: Plaza de John Kennedy) or the hop-on hop-off bus tour. The Funicular de Tibidabo must then be taken the remainder of the way up. Alternatively, visitors can take the Tibibus, which travels from Plaça de Catalunya to the park. You can either buy an all-access pass, or pay for some of the rides individually. Note that the park closes during several weeks in winter, and has varying hours all year round, so consult the schedule in advance. Hours: The park closes during several weeks in winter, and has varying hours all year round, so consult the schedule in advance. The summit of the Columbus Monument, located at the end of the bustling La Rambla boulevard, offers stunning views of Barcelona’s seaside city sprawl. Guarantee your entry to the historic landmark by purchasing your entrance ticket in advance, thereby ensuring you enjoy panoramic vistas of the Gothic Quarter, Santa Maria del Pi Basillica, and Barceloneta Beach. Upgrade to enjoy a glass of wine from a region of your choice, accompanied by a Spanish tapas taster, in the monument’s wine tasting area. Zip around Barcelona on-board a classic Vespa scooter on this action-packed 4-hour tour! Follow your guide around Barcelona’s vibrant neighborhoods and hop off to marvel at Gaudi’s iconic La Sagrada Familia and admire the architecture of the Gothic Quarter. With your own transport, you’ll get to explore further than a regular tour, so you can glide along Barceloneta beach, take in the views from Tibidabo and get off-the-beaten-track as you seek out little-known local haunts. Enjoy an alternative sightseeing experience of Barcelona on this private 2.5-hour trip to Tibidabo Mountain and Parque del Laberinto de Horta, including hotel pickup and drop-off. Explore the neoclassical gardens of Parque del Laberinto de Horta and then ascend Tibidabo Mountain, home to one of Spain’s oldest theme parks, to absorb spectacular city views. On this private tour, you’ll receive undivided attention from your guide and travel in an air-conditioned Mercedes vehicle. Soak up the magic of Barcelona by night on a classic Vespa scooter! Hop aboard for a thrilling 4-hour tour and marvel at illuminated landmarks like La Sagrada Familia, Casa Batlló and Torre Agbar. Zip around the atmospheric Gracia and Eixample districts; visit Plaça Catalunya and Plaça d'Espanya, and admire the glittering city skyline from Tibidabo and Montjuïc hill. This small-group tour is limited to four, ensuring an authentic local experience. In this private tour our guide will take you to the best roads around the city, including some solitaire roads and demanding climbs. You will have a full carbon bike equipped with Shimano 105 groupset, compact crank 34-50, 11 speed.This is a nice cycling stage and also including the best views over the city!We will adapt the distance and difficulty to your needs. From 60 to 85 km including 3-4 climbs. Also we adapt the pace so you can feel comfortable with it! This LGBTQ-friendly tour of Barcelona lets you see the city sights through the lens of Barcelona's vibrant gay community. Discover hidden gems such as Tibidabo Mountain and and Parque del Laberinto de Horta along with an enthusiastic private guide. This tour also includes a special map showcasing Barcelona's gay-friendly venues for you to explore on your own.